Talk about the winter that wouldn't end! Spring is a very exciting time for gardeners, who are itching to get out into their yards. Many of us have experienced a long, cold winter and record snowfalls. Isn't it amazing that record cold temperatures haven't affected Spring's blooms. 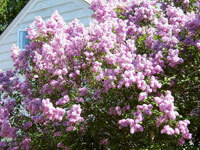 Lilacs have their buds, and the bulbs are coming up just as they have during milder winters. Will You Plant a Victory Garden? Who is the Plant Man? What's New at Backyard Greenhouses? Whatever Happened to Service? And...don't miss out on our Spring Sale...our beautiful Victorian Greenhouses are on special now for a limited time only. 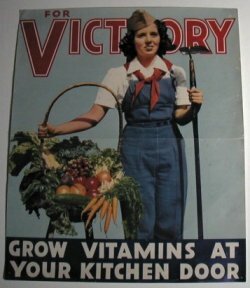 With today's troubled times, I was reminded of a past article we had written on Victory Gardens. We've posted the article again, as we have many new subscribers who haven't yet read this article. We don't often think of gardening and war as being connected, but they certainly were during World War II. 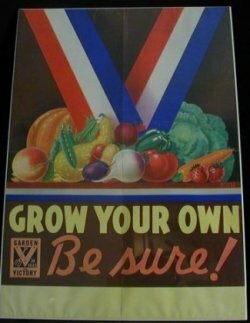 World War II, a different time, a different era and I couldn't help but think of the importance of the Victory Gardens planted by millions of Americans and Canadians. What we must keep in mind, is the difficulty of gardening during this era. In addition, to experiencing many years of economic hardships, people purchased war bonds, conserved raw materials for recycling and rallied behind their troops. Many had family members who lost their lives. People were asked to create their own gardens, and most had no knowledge of gardening skills. None of us want a future filled with uncertainty. If times get tough, perhaps the ability to grow your own Victory Garden will bring you and your family comfort. Many of you already have your own Victory Garden. I had the pleasure of growing my own Victory Garden this past summer and enjoyed many of the vegetables listed above. Upon my return home from work, I'd stroll through the garden, picking and pulling what we wanted for dinner. Nothing compares to the taste of fresh picked produce. Sometimes Spring can create tricky temperature conditions in the greenhouse due to temperature fluctuations. If you have disabled your solar powered roof vents, ensure that they are now working. Both seedlings and plants need adequate ventilation and air circulation. Check the need for watering daily, especially if you've started seeds that need to be kept moist. Certain soil mixtures hold water longer than others, and you will soon know how quickly the soil that you have used dries out. I've started several seeds that include various red, green and jalapeno peppers, various types of lettuce, tomatoes and cucumbers. There's nothing like a fresh salad right out of the garden! I've also started several annuals including Morning Glory, Marigolds, Petunias, Bacopa, Coleus and Impatiens. It's amazing how quickly these seeds germinate. I planted the Morning Glory direct into hanging baskets this year. I've also taken cuttings from Ivy Leaf Geraniums, Bacopa and Impatiens. Growing your own vegetables and flowers is fun, easy and pays for your greenhouse in no time! If you've started seeds in your greenhouse and have tips to share with us, why not submit a Guest Article to us. I'm sure this information would benefit many of our newsletter subscribers. Unfortunately, customer service seems to be a dying art. With so much competitiveness in today's marketplace, we believe that companies have to differentiate themselves by service. Everyone should receive exceptional service and we pride ourselves on the service that we provide. Have you tried calling a company, only to end up in an automated loop and eventually have to hang up? Or perhaps you've been on hold for what seems like forever. I've even contacted companies during business hours where no one has answered, including an automated attendant. At Backyard Greenhouses, we have dedicated toll free phone lines and answer each and every call personally. You will only receive our automated attendant in the unlikely event that all of our phone lines are busy at the same time, or if you are calling after regular business hours. We're confident that if you call us, you'll get a live person! If you do leave a message, we will call you back promptly. Have you called or visited a company, and the individual you are speaking with doesn't have the expertise to answer your question? Nothing is more annoying than asking a question and hearing "I don't know" as the answer. I don't expect everyone to know everything, but at least an effort could be made to find out the answer! We pride ourselves on our expertise. Go ahead, call us.we'll be happy to answer any questions that you may have. If we don't know the answer, we'll get it for you in a timely fashion. We are not just a "dot com" company. We have been in business since 1972 and we do have a show room where our greenhouses and garden products are on display. We also have a greenhouse installation team and have built many greenhouses for our customers. In order to provide you with excellent service, Backyard Greenhouses has stringent guidelines that all of our suppliers must follow. Some of these guidelines include quality products, exceptional customer service, product expertise and timely shipments. We know you can shop anywhere. That's why we are dedicated to providing you with exceptional service, expertise, quality products and competitive pricing. When you buy from us, you buy with confidence! Spring has finally arrived! Grab a shovel, put on some gloves and start planting! We've all got our list of spring projects to do, and I for one am anxious to get started.